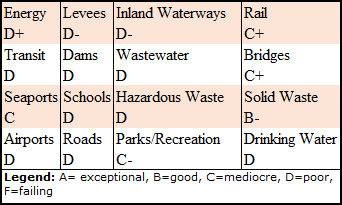 Over the course of the last 80 years, most the public infrastructure capacity in the United States has been designed, built, financed (either through public coffers or public-private partnerships) operated and, to varying degrees, maintained. The benefits for Americans have been increased economic activity, enhanced quality of life for citizenry and forged pathways to greater prosperity serving as an implementation tool delivering on the mantra of the invisible hand for business, government and society. The downside has been simply infrastructure has not kept up with the demands of an increasingly productive society. Little indicated in Public Works Management & Policy the “debate over the condition of the nation’s infrastructure has been recurring” for many decades. Furthermore, costs for adequate maintenance and new construction have skyrocketed. Current estimates for infrastructure investment range from US$1.3 trillion to US$4 trillion. 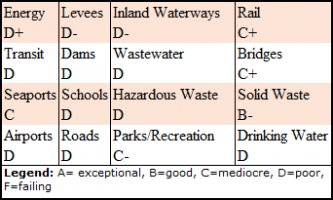 In their “American Infrastructure Report Card” released in March 2013, the American Society of Civil Engineers (ASCE) graded U.S. infrastructure an overall D+ with an estimated investment needed by 2020 of US$3.6 trillion. No wonder people are awestruck in discovering the Lincoln Tunnel in New York City and the Hoover Dam, Tennessee Valley Authority, as well as many other large infrastructure projects were built during the depression era of the late 1920s and 1930s. In 2017, infrastructure has aged way beyond its depreciable lifecycle. How do we continue extending the end of period lifecycle for infrastructure? Should we tear down existing infrastructure and start anew? Is there a middle ground consisting of maintenance and greenfield build? What can we do that would be cost-beneficial? The combination of direct and indirect costs have led the U.S. to a critical juncture. Financial constraints impose a burden upon policy choices. While the current state of infrastructure is poor, the pragmatic choice of addressing infrastructure might just be driven by the level of productivity. In a 2007 study conducted by Per Pinstrup-Andersen and Satoru Shimokawa for the World Bank, increasing productivity can be attributed to; amongst other things, infrastructure, appropriate institutions and access to technology. Simultaneously, during the beginning of the 21st century, the concept of Smart Growth ushered in a new era of environmentally friendly, socially beneficial and economically sound infrastructure fueled by the growth of information communications technology. At this point in the discussion, an overview of what types of infrastructure are at risk is followed by a set of technology domains both businesses and public organizations are creating and utilizing in order to resolve the aging dilemma as well as financial constraints. According to ASCE, infrastructure consists of physical assets comprising 16 categories including energy (generation, transmission and distribution): transit, seaports, airports, levees, dams, roads, inland waterways, wastewater, hazardous waste, rail, bridges, solid waste and drinking water. Add in social infrastructure such as schools, and last but not least, public parks and recreation. Each category was evaluated based on capacity, condition, funding, future need, operations and maintenance, public safety, resilience and innovation. A new report card will be forthcoming in March. In June 2015, the National Association of Counties (NACo) released their report on technology solutions for more resilient counties. The report focused on the following three areas: transportation, water and energy systems. Consistent with Herbert Simon’s theory of bounded rationality, the three areas for focus by NACo wield direct impact upon the economic performance of counties. The report also depicts technology areas of practice at various counties including traffic management in form of autonomous vehicles and eludes to Internet of Things, encompassing device (sensors, location based services, machine to machine and so forth) connectivity, and another broad technology domain, infrastructure as a service, essentially cloud computing, data center storage and networking. In order to properly assess the impact of technologies, a framework for doing so should be developed. Two types of technologies (with subsets) including physical and information communications can be juxtaposed with the infrastructure categories in Table 1 in order to compare/contrast their impact. Often taking a backseat to hi-tech, physical includes technology domains such as durable materials and construction design among others. The importance of physical technology is illuminated by costs. For example, the American Water Works Association stated 237,600 water line breaks occur annually costing public water utilities (ultimately ratepayers) US$2.8 billion per annum. Additionally, in a 2014 report the National Economic Council indicated Americans spent US$120 billion in extra fuel and idle time sitting in traffic for 5.5 billion hours. Information communications technologies and physical technologies can bring to bear an expansive array of technologies and services/solutions that will substantially improve the performance and sustainability of public infrastructure. This article is the first in a series of articles intended to demonstrate the social, economic, environmental and financial impacts such technologies possess. Oftentimes, invisible to the casual observer, such technologies (when deployed and fully integrated) prove to be cost effective, delivering best value. Crucial to this understanding is the fact that technologies underlying public infrastructure initiatives are currently available. The intended consequence may be less of a drain on public financing resulting from public private partnerships, social impact, environmental debt financing. The unintended consequence may be increased productivity and innovation. Author: Daniel G. Bauer is finishing his Doctorate at the School of Public Administration at Florida Atlantic University. Mr. Bauer has an Executive MBA from the College of Business at Florida Atlantic University and a BBA in Finance from University of Toledo. Daniel has 20+ years of professional experience both domestically and abroad. His research areas focus on finding solutions at the confluence of financing, procurement/supply chain, organizational behavior, sustainability, and social responsibility.